From Ole T. Saether starting in 1879 To Paul T. Saether celebrating 140 years of service in 2019. The history of our family and firm speaks for our dedication to our communities, and the quality of service that we offer families at a very difficult time. Our family is here to serve your family, and guide you through the choices that you have with burial or cremation when a friend or relative dies. We thank those families that have allowed us the honor of serving them at some of the most difficult times of their lives for the trust that you placed in us. We pledge to continue to strive to earn that trust for years to come. Ole T. Saether, a native of Norway immigrated to this area in 1879. He started in business making furniture and barbering. Eventually he also made caskets and started an undertaking business. Gradually, the cabinet making ceased, and the business became a furniture store and funeral home. 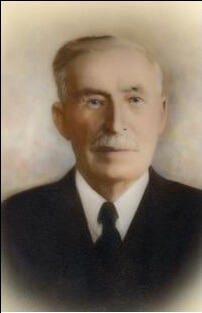 In 1910 Ole’s son, Hannock Saether joined him in business. In 1935 Hannock’s son, Rex Saether joined, and in 1958 Rex’s son, R. Thomas Saether became the fourth generation. In the 1970’s Tom and his wife Kay changed the focus of the furniture store from one serving the local area to one offering high quality furniture and interior design services serving a wider area including all of southern Wisconsin and northern Illinois. In 1987 Tom’s son, Paul Saether became the fifth generation to receive his Embalmers and Funeral Directors license and enter the family business. In 1998, after the retirement of Tom and Kay, Paul and his wife Julie made the difficult decision to close the furniture store in order to concentrate on funeral service. In 2002 Paul and Julie started a new business, the Saether Livery Service, serving funeral homes in southern Wisconsin and northern Illinois providing a hearse with driver to assist firms with their funeral services. Currently Ole, Hannock, Rex and Tom are deceased. Kay is retired and lives in her lake home in Hustisford. The Saether Livery Service is a supplemental business that Paul Saether started in the summer of 2002 with the purchase of our first hearse. This business grew out of Paul’s love of cars, and especially a love of funeral cars. Through this business we serve other funeral homes by providing a hearse and a driver/funeral helper to help with their funerals. Some of these funeral homes do not own a hearse, and hire us for all their funerals, and some of them hire us on days that they are extra busy and need more hearses than they have. We are currently serving a territory extending from Waupun, Wisconsin to Rockford, Illinois to Dubuque, Iowa from Dodgeville and Blanchardville, Wisconsin. At this time we have five hearses and ten drivers. 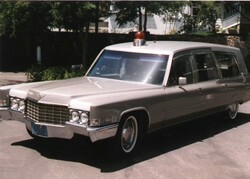 In 1990 Paul Saether purchased an antique vehicle that was built as both a hearse and an ambulance. Paul remembers as a child riding in the hearse-ambulance that his father, Tom had to serve the communities with ambulance service and as a hearse for the funeral home. Paul purchased this vehicle to enjoy as an antique, and to use for promotion for the funeral home. Paul and his family have traveled in this vehilce to many national shows for antique ambulances and hearses across the midwest and into Canada.